Eisbach Group is a unique corporate development advisory firm that delivers M&A and strategy advisory solutions across the technology and health care sectors. We are industry veterans who have experienced the world through the eyes of our clients. We draw on our knowledge, expertise and proven methods to help your corporate development and strategy functions get the best results. Our cross-discipline expertise, unique knowledge, and strong global partnerships differentiate us from other boutique M&A firms. We help our clients generate both organic and inorganic growth by creating the right mix of proven and innovative strategies and further helping you through execution. We stand behind our work and create view our client relationships as long term. Drop In Media is a mobile content delivery service provider. Pioneering mobile messaging in North America, Drop In Media connects media, publishers and brands with mobile consumers, enabling the delivery of premium content over mobile devices. The company was growing, revenues were strong, but long payment cycles made the business struggle with cash flow and shrinking profitability. We helped our client excel in their execution by adding efficiencies to the supply chain management, improving working capital, and accelerating profitability. We increased gross margins as well as operating margins by over 20%. An industry leader of comprehensive network solutions for businesses and data centers around the world was evaluating growth opportunities in new market segments, which required the business to restructure from a functional into a business unit driven organization. We engaged in redefining the business strategy, helped reformat the organization and management structure, and to adapt budgets and performance metrics. We developed a new strategy management framework, a new planning process, and updated management-reporting standards. Our framework laid the foundation for the business’s long-term growth path. The business continued to grow organically and through a series of acquisitions. The restructuring enabled the company to scale from a $500 million to a $2 billion company. Guavus is a ‘big data’ analytics provider, who integrates with a suite of decision-making applications that enable enterprises to make better-informed and timelier decisions. 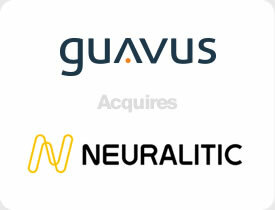 The company was evaluating product and market expansion strategies and had identified a potential international acquisition target, Neuralitic Systems. We assisted with the evaluation and execution of their business development plans, including M&A strategy development, deal management, valuation, negotiations, due diligence, and integration. We advised on international legal, tax, and accounting matters. The international acquisition outperformed its projections by four times, and target ROI for the investment was achieved within the first year. Crowdcast is a social business intelligence solution that taps into the wisdom of their employees and partners to deliver insights and forecasts related to current and future initiatives in order to make better strategic decisions. With a unique product in an emerging market, the company was evaluating their strategic direction and funding options. We were engaged to evaluate the potential of strategic partnerships versus the sale of the business. We steered sourcing and proposal development for broad range of prospect acquirers. 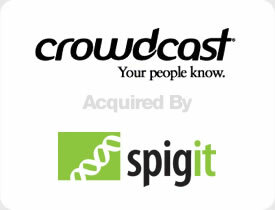 We directed the M&A process, due diligence, and deal execution, resulting in a successfully sale of Crowdcast to Spigit. Spigit is a software provider for enterprise innovation management solutions.